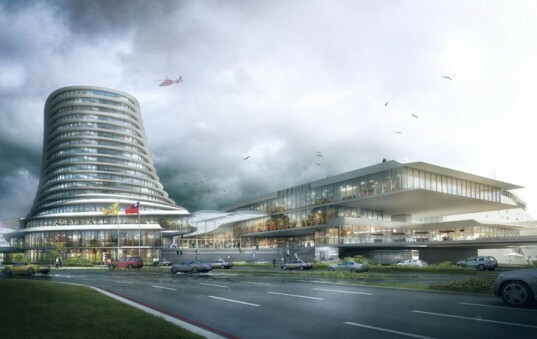 When developing a design proposal for a new Joint Office Building and Passenger & Cargo Terminal for Keelung, Taiwan, Dutch architectural firm de Architekten CIE paid close attention to the local climate and sought to make the development as energy efficient as possible. 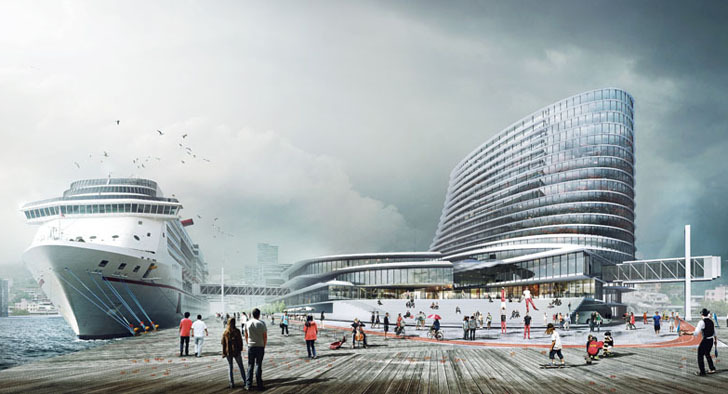 The new mixed-use development sits on Keelung's waterfront, and it will serve both passenger and commercial ships while providing office space for the city. By taking advantage of natural ventilation to cool the buildings, the architects aim to reduce the development's overall energy use. The city of Keelung — Taiwan’s second-largest seaport — is characterized by extreme heat and humidity, as well as plenty or wind and rain year-round. “The result is perhaps one of the most difficult climates to build naturally ventilated and energy efficient buildings,” explain the architects in a statement. However, de Architekten Cie.’s proposal uses natural ventilation to cool the main building during the winter, spring and fall seasons. The rounded shape of the building also factors into its ability to naturally cool itself without excess air-conditioning. “The extremely constant wind direction and velocity mean that the form of the building is intended to maximize the possibility of using cross ventilation to exhaust hot air from the building during natural ventilation mode (almost half of the year),” the architects explain. Inside, de Architekten employed a zoned climate strategy, setting different temperature and humidity controls based on how different parts of the building will be used. The city of Keelung -- Taiwan's second-largest seaport -- is characterized by extreme heat and humidity, as well as plenty or wind and rain year-round. "The result is perhaps one of the most difficult climates to build naturally ventilated and energy efficient buildings," explain the architects in a statement. However, de Architekten Cie.'s proposal calls for natural ventilating the main building during the cooler winter, spring and fall seasons. The rounded shape of the building also factors into its ability to naturally cool itself without excess air-conditioning. "The extremely constant wind direction and velocity mean that the form of the building is intended to maximize the possibility of using cross ventilation to exhaust hot air from the building during natural ventilation mode (almost half of the year)," the architects explain. Inside the building, de Architekten employed a zoned climate strategy, setting different temperature and humidity controls based on how different parts of the building will be used.